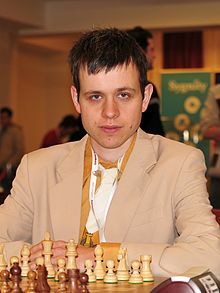 David Navara (born 27 March 1985) is a Czech chess Grandmaster, the highest-ranked player of his country. He won seven times the Czech Chess Championship (in 2004, 2005, 2010, 2012, 2013, 2014 and 2015) and the European Blitz Chess Championship of 2014. As of the May 2015 FIDE rating list Navara achieved a personal high with an Elo rating of 2751 and was ranked number 14 in the world. His career progressed very fast under coaches like Miloslav Vanka, IM Josef Přibyl, and GMs Luděk Pachman and Vlastimil Jansa, as he won several world medals in youth categories. In 2001, aged 16, he got 7/9 in the European Team Championships. One year later, three days before his 17th birthday, he received the Grandmaster title, next year he won the open tournament in Polanica Zdrój. Ranked 14th, he finished sixth in the 2004 Fifth European Individual Chess Championship in Antalya with 7.5 points (+5−2=5), including a draw against the eventual champion Vassily Ivanchuk. In 2005, Navara participated in the World Chess Cup, where he was eliminated by Predrag Nikolić in the first round. He was very successful in the 37th Chess Olympiad 2006, having 8.5 points from 12 games against world-class competition. Navara played several matches in Prague, drawing with Anatoly Karpov (+0−0=2) in 2005 and Boris Gelfand (+1−1=2) in 2006 and winning against Nigel Short (+3-0=3) in 2007 and Sergei Movsesian (+1-0=5) in 2011. In 2007 he was invited for the first time into the supertournament in Wijk aan Zee, where he replaced Alexander Morozevich. Navara, nicknamed Navara Express by organizers, gained 6.5 points in 13 games (+3−3=7), including wins against Ruslan Ponomariov and Magnus Carlsen (and draws with black pieces against Kramnik, Anand and Topalov), and finished in 7th place. In August 2007 Navara finished first in the big Ordix Open with a score of 9.5/11 on progressive score tiebreak. In September he played in Karlovy Vary tourney where he finished 3rd half a point behind the winners Ponomariov and Movsesian. He also participated in the European Team Chess Championship where he scored 6 points out of 9 game on the first board for the Czech team. In November 2007 Navara participated in the World Chess Cup. He beat Ivanov of US in the first round but was defeated in the tie-breaks by Rublevsky in the second round. In 2007-2008 Navara played in the Torneo di Capodanno in Italy, scoring 3/8 (+1 -3 =4). He played in the Baku Grand Prix Tournament in 2008, scoring 5.5/13 (+2 -4 =7). At the 2011 Tata Steel version of Wijk aan Zee, Navara competed in the "B" group against other strong GMs like Wesley So, Lê Quang Liêm, Luke McShane, Vladislav Tkachiev, Zahar Efimenko, and others. Navara tied for first place with Luke McShane by finishing with 8.5/13. While McShane finished ahead on tie-breaks, both players received invitations to the top "A" group next year. Navara also took part in the Chess World Cup 2011, but lost to Alexander Grischuk in the quarterfinals of the competition. Navara obtained a degree in logic at Charles University in Prague. In the following game, played in the Ordix Open, the Czech grandmaster David Navara defeats former top Armenian grandmaster Rafael Vaganian. Navara decides to test a powerful pawn sacrifice in the Tarrasch variation of the French defense. It was introduced into tournament play more than 60 years ago by the Australian Cecil Purdy, the first correspondence world champion, and it still carries plenty of punch today. Vaganian's problems began after he lost the battle of the only open file and allowed the Czech GM to claim victory with neat tactical play. 1.e4 e6 2.d4 d5 3.Nd2 c5 4.Ngf3 Nf6 5.e5 Nfd7 6.c3 Nc6 7.Bd3 Qb6 8.0-0!? (A promising pawn sacrifice that became fashionable after the game Korchnoi-Udovcic, Leningrad 1967.) 8...cxd4 9.cxd4 Nxd4 10.Nxd4 Qxd4 11.Nf3 Qb6 12.Qc2 (Purdy's choice. 12.Qa4 Qb4 13.Qc2 was also played in the past, but there is no need to improve the position of the black queen.) 12...h6 13.Bd2 (White finished his development and is prepared to seize the c-file with his heavy pieces. Some players prefer 13.Bf4.) 13...Nc5?! (Walking into a dangerous pin. Exchanging the bishops with 13...Bb4, leads to the weakening of the dark squares after 14.Bxb4 Qxb4 15.a3 Qe7 16.Rac1 0-0 17.Qc7! with an unpleasant grip.) 14.Be3! (Threatening to win outright with 15.Rac1. Black must do something about the pin.) 14...Qb4 (Another way to break the pin is 14...Qa5? !, but after 15.b4! Qxb4 16.Rab1 Nxd3!? 17.Rxb4 Nxb4 white's material advantage should tell in the long run. The game Zapolskis-Jorgensen, Dos Hermanas 2004, continued 14...Bd7 15.Rac1 Rc8 16.Qd2 Qd8 17.Bb1 Be7 18.Nd4 a6 19.f4! and after 19...f5 20.exf6 Bxf6 21.Bg6+ Kf8 22.Rxc5 Rxc5 23.Nxe6+ Bxe6 24.Bxc5+ Be7 25.Bxe7+ Qxe7 26.f5 Bf7 27.Rc1 Qd7 28.Qf4 Bxg6 29.fxg6+ Ke8 30.Qe3+ Qe7 31.Rc8+ black resigned.) 15.Be2 Bd7 16.Rfc1 Rc8 17.Nd4 Qa5 (After 17...Na4, the queen sacrifice 18.Qxc8+! leads to a powerful attack after 18...Bxc8 19.Rxc8+ Kd7 20.Rac1 Nc5 21.Ra8! with fairy-tale variations such as 21...Qxb2 22.Nb3! Qxe2 23.Bxc5 Qxa2 24.Bb6! Bd6 25.Rxa7 with white's advantage or 21...a6 22.b3! f5 23.a3! Qxa3 24.Bb5+ Ke7 25.Nxf5+ Kf7 26.Be8+ Kg8 27.Ne7+! Bxe7 28.Bg6+ Bf8 29.Rxf8+! Kxf8 30.Bxc5+ and white wins.) 18.a3 Qd8 19.Bb5! (Threatening to win with 20.b4.) 19...Ra8 (Abandoning the c-file leads to problems.) 20.b4 Na6? (A blunder, but after 20...Bxb5 21.Nxb5 a6 22.Nd4 Ne4 23.f3 Ng5 24.Qc7 Rb8 25.Nb3 Be7 26.Ba7 white should win.) 21.Nxe6! fxe6 22.Bxa6 b6 (A sad admission. White mates after 22...bxa6 23.Qg6+ Ke7 24.Bc5 mate.) 23.Qg6+ Ke7 24.Rc3 Qe8 25.Qg4 Kf7 26.Bd3 Kg8 27.Bg6 Qd8 28.Rac1 (Black can hardly move.) 28...a5 29.b5 (Another winning line is 29.Rc7, for example after 29...axb4 white deflects the black queen from the pawn on e6 with 30.Rxd7! Qxd7 31.Rc7! Rxa3 32.g3, since 32...Qxc7 allows 33.Qxe6+ and white mates; or after 29...Bc5 30.Qf3 Be8 31.Bf7+ Kh7 32.Qg4 Rf8 33.Bxh6! white mates soon.) 29...Bc5 30.Bxc5 bxc5 31.Rxc5 Qe7 32.b6 Rb8 33.b7 Qf8 (33...Rxb7 is met by 34.Rc8+!) 34.Rc7 Black resigned. David Navara vs Zdenko Kozul, 37th Chess Olympiad 2006, Sicilian, Richter-Rauzer Attack, 7...a6 Defense, 8...Bd7 (B67), 1-0 Both sides are attacking, but Navara is the first to mate. David Navara vs Peter Svidler, 37th Chess Olympiad 2006, Queen's Gambit Declined Slav (D16), 1-0 A typical breakthrough 19. d5! and a nice mate combination ending the game. Ivan Cheparinov vs David Navara, European Team Chess Championship, Ruy Lopez A spectacular and unexpected queen sac 27...Qf2!! Alexander Moiseenko vs David Navara, World Cup 2011, Queen's Indian Defense After a long struggle, Navara offered a draw in a winning position. Earlier in the game, Navara accidentally touched a piece, but Moiseenko did not insist on the "touch-move" rule that would have lost him the game. Moiseenko was subsequently outplayed by the Czech GM, who with a forced mate on the board offered him a draw. David Navara vs Radoslaw Wojtaszek, Biel 2015, Sicilian, Najdorf Variation, English Attack An extraordinary home preparation by Navara that resulted in his white king heading to the h8 square during the middle game, as the righteous leader of the commanding white forces.